When do Portenos sleep? 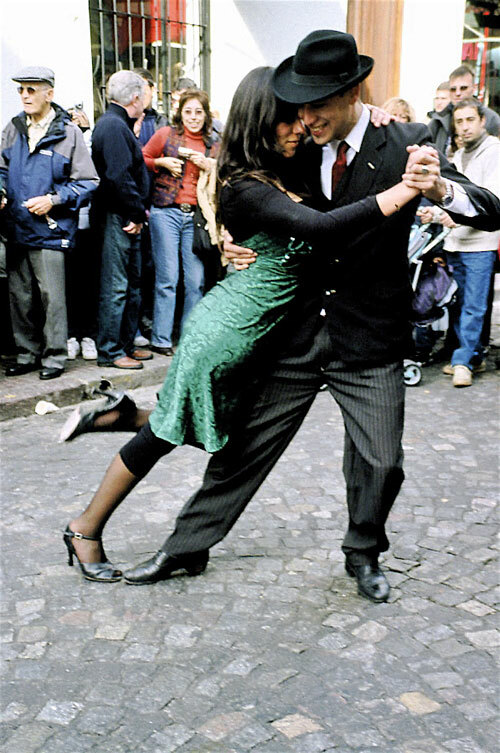 (That’s what Buenos Aires residents call themselves.) “Sometimes they stay home Monday and Tuesday to catch up on sleep,” we are told. Ask for la cuenta (the bill), and notice the cubierto (cover charge), usually from 60 cents to $2 US per person, but then only 10% is expected as tip. Pesos are written with a dollar sign. Though the dollar was fading fast against the Euro this winter, it had muscle in this town, moving from $3.05 to $3.30 pesos per $1 during July. Both dining out and the taxi that takes you there are cheap. Lunch may run $5, although our buffet at the Alvear Palace Hotel cost $70 US for the two of us. A dinner in a stylish spot in Palermo, the Soho of Buenos Aires, might be $50 for a couple…$90 US for two was the most we spent. You can pay $10US for a good Argentine Malbec, $3 to $5 US by the coppa (glass). Note that the number follows the street name. By the way, other airlines with one stop service to Buenos Aires are cheaper but American Airlines flies direct non-stop from JFK and soon from Chicago as well. Alvear Palace Hotel, Av. Alvear 1891 (Recoleta) T: (54 11) 4808-2100. 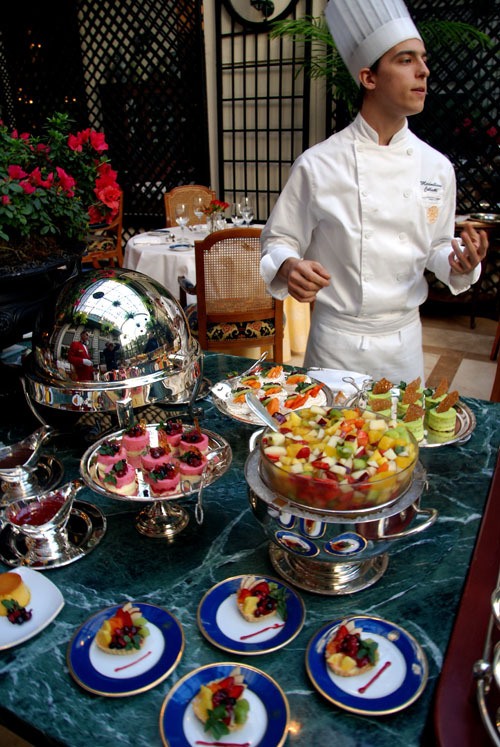 After the long morning march of sightseeing or a lazy morning sleep-in, give in to decorator swags, bouquets of roses and goldenrod, obsequious waiters, cushy brocade armchairs, and all you can eat at this ambitious lunch buffet, definitely worth $70 US for two. No need to dress up. Local businessmen slip out of their jackets to dine in shirtsleeves. I’m drawn to the light in the garden room with its monumental glassed-in iron gate. 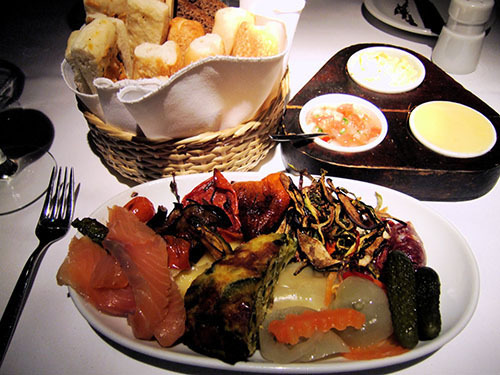 Start with cold dishes: marinated vegetables, salad makings, exquisitely tender langostinos and baby shrimp, the slightly too cooked salmon with a trio of sauces, small mozzarella balls caprese, even burrata. Skip mostly leatherized meats in the silver chafing dishes, and have more langostinos plus cheese with the sensational house breads. Then from the fantasy pastry display, make yourself a chocolate tasting. Come back for a bowl of fresh fruit, maybe the fruit tart too. Oviedo, Beruti 2602 (Capital) T: (54 11) 4821-3741. Lebanese-born Emilio Garip, affable and serious, almost always in his restaurant, runs this highly-rated institution, clubby in feel, known for Castilian Spanish food (classic and new) and its impressive cellar. 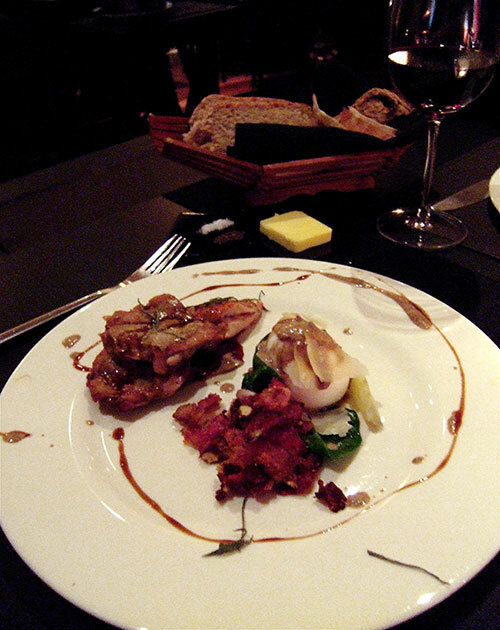 Affluent locals sent us here for fish – my red mullet with roasted tomatoes and mushrooms was only slightly too cooked (I asked for it rarish) but crisped baby squid with bits of bacon in lentils, evoking earth and sea, is just one of several fine starters. Crusty suckling pig combines crackling skin, meat both juicy and dry alongside flowers formed of candied peppers (creative frippery). Exceptionally delicious desserts – try the classic apple pancake and the pear Napoleon – are a surprising dividend. Expensive by Argentine standards, though modest on a New York scale. Resto, Montevideo 938 (Capital) Inside the Sociedad de Arquetectos. T: (54 11) 4816-6711. Possibly my favorite food…by a gifted woman chef who prepped in France with Michel Bras. Lunch, Monday to Thursday; dinner Thursday and Friday only. Small and often booked ahead by savvy locals with babies nodding in strollers and tonight, a visible scattering of grape nuts. (The corkage fee is a beneficent $3 US if you bring your own bottle). For me, $5.50 buys a generous pour of local Cabernet in a large goblet (between toting orders, servers take turns washing and drying glasses by hand. From five three course menus -- $13 US to $24 -- I will not soon forget my $20 US tasting. An offered sip of something sparkling. The intense lemony sauce of a broccoli and zucchini gift from the kitchen. 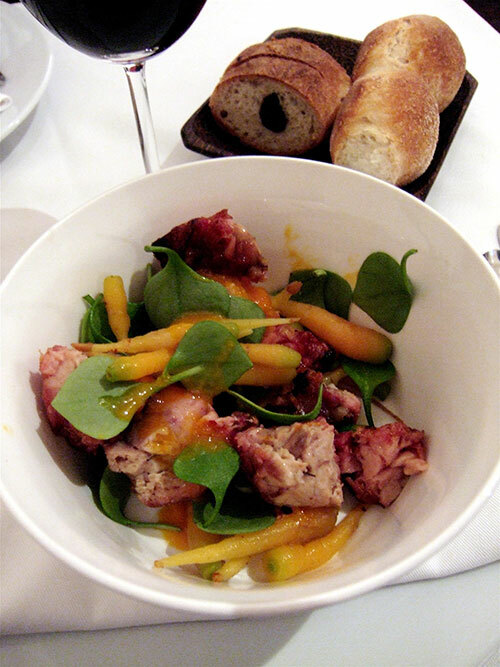 Crusty quartered sweetbreads, soft and organic within a deep white bowl with teeny carrots, thin and thinner. And white salmon, rare as requested, with beans, ham and watercress pesto. Steven’s roasted Japanese ginger-touched pumpkin soup with chunks of salmon and brioche toast is a flavor and texture revelation to. His quail is plump and juicy stuffed with what looks like a bonsai Christmas tree. “Borage and onion,” says the menu; “Fennel fronds,” the waitress suggests. Millet, lemon, mascarpone and chestnut risotto alongside. Ice cream “in a tube” (the menu has an English translation) means on a stick -- with chopped nuts and dulce de leche to roll it in. Happening, Av. Moreau de Justo 310, Puerto Madero T: (54 11) 4319-8712. Porteños are proud of this upscale commercial and residential gentrification of an abandoned port marked by bright yellow cranes left behind as sculpture. Cynically, I anticipate a touristy rip-off, but we spent not quite $120 for our four, tip and a bottle of wine included. It is a quiet Sunday evening in this sprawling space with families still trickling in at 10:30. 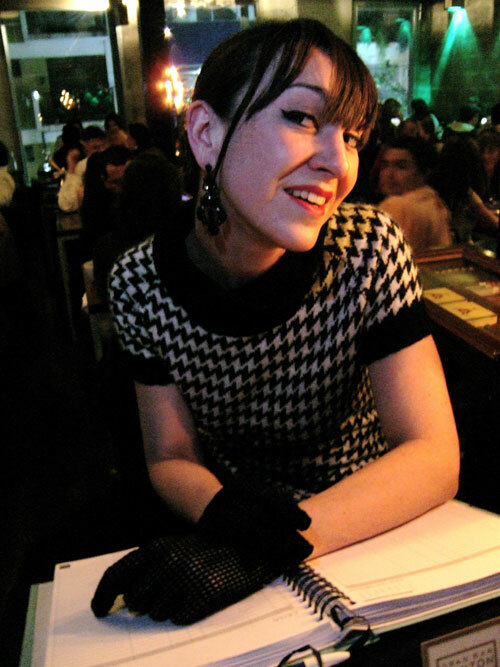 The waiter smartly handles our local divas with kid gloves. Once we’ve toured the cold buffet, none of us can resist this stupefying offering of cheeses, salumeria, terrines and salads, objects mysterious and vaguely familiar, just $8 per person per decent size platter. Just when we’d decided the charm of Argentina’s grass fed beef was a myth, the Road Food Warrior gets his almost perfect rib eye: seared and meaty, not too tough. We watch it cooking on fiery heat behind the glassed in grill, flames never touching the meat. Careful grilling shows that sweetbreads needn’t turn into galvanized rubber. Alas, given the fat and gristle, it’s not easy to get at the one ounce of edible meat on each lamb chop. Thymus, Lerma 525 near Malabia (Palermo Viejo) T: (54 11) 4772-1936. “Are we having parts tonight?” Steven asks. He’s not a fan of innards but he knows I love sweetbreads. Actually thymus is Latin for thyme. Walk through a garden into a smart black and white design as beautiful as advertised; all the carved stone sculptures are by the owner’s father. An amuse of thyme and cabbage-filled Chinese dumplings with crystals of salt on top in a little wicker steamer is the surprise that sets the stage for chef Fernando Mayoral’s eclectic, personal, mostly delicious food. Order a la carte or from four three-course menus priced by choice of entree: $14 for vegetarian, $18 for chicken, $20 for fish, $24 for beef, quail or duck. Both the sliced duck breast with a kind of corn stuffing and the chicken with a poached egg wrapped in a Swiss chard apron -- or at least the dark meat, salty but moist and good -- are better than the starters we’ve chosen: pleasant enough sweet potato gnocchi with lamb shoulder stew and über-designed beef tartare. Brown sugar sorbet is as saccharine as it sounds but orange marmalade gelato is an inspired invention. Sante, Peña 2300, (Recoleta) T: (54 11) 4805 6794. Through the big plate glass widow, this looks like a luncheonette with creamy Formica tabletops. Embroidered cotton napkins, fresh flowers in a niche, cool jazz on the sound system, and owner Pablo Osan interacting with the clients, mostly young, mostly speaking English, elevates the seriousness of Sante. We stopped in for tapas one evening with a friend of Osan’s, had crostini, pumpkin puree piled on small house-baked rolls warm from the oven, and perfectly cooked shrimp riding on a salad of avocado chunks with portabellos and tomato, held together with a lime-cilantro mayonnaise. I couldn’t wait to taste that salad again. We walk from our apartment a block away, just the two of us. There is a generous pour of a good red wine by the glass for $4, a Pinot noir the host recommends, perfect with my dish of Chilean salmon chunks, really rare (“cruda” is the way to say it), on half moon thins of raw beet with baby spinach scattered on top. Sante, indeed. All around us, I spot vegetables and greenery on most every plate. Oyster sauce moistening Steven’s penne with sea food adds an odd sweetness but he doesn’t seem too upset. Indeed he’s eager to return for dinner our last evening in town. Sudestrada, Guatemala 5602 at Fitzroy (Palermo Hollywood)T: (54 11) 4776-3777. When you’ve had a few too many barely chewable steaks and can’t handle yet another pizza, you may be ready for this not necessarily authentic but wonderful Pan-Asian spot. It’s white, very white with giant napkins, and does a lunch so popular (with a $7 two-course prix fixe that includes beer or a sensational lemongrass lemonade) they often have to lock the front door. Giant napkins are just one sign of caring. Amiable serving crew is another. 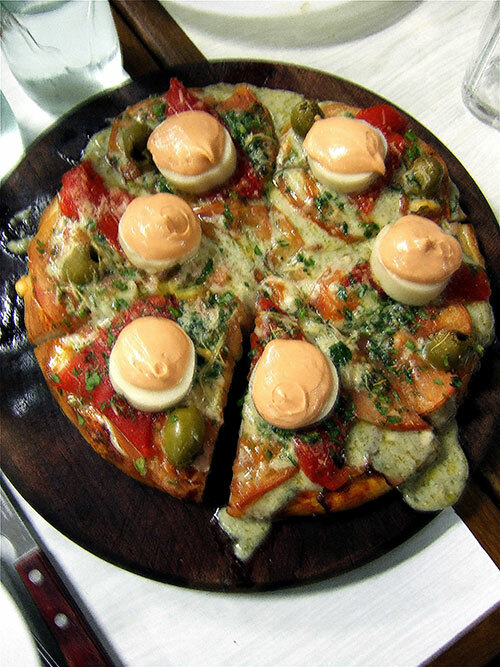 A few dishes (asterisks warn chili-heat) are too spicy for Argentine friends but perfect for New York hot heads. Flavors are clean; dishes carefully turned out, prettily plated. 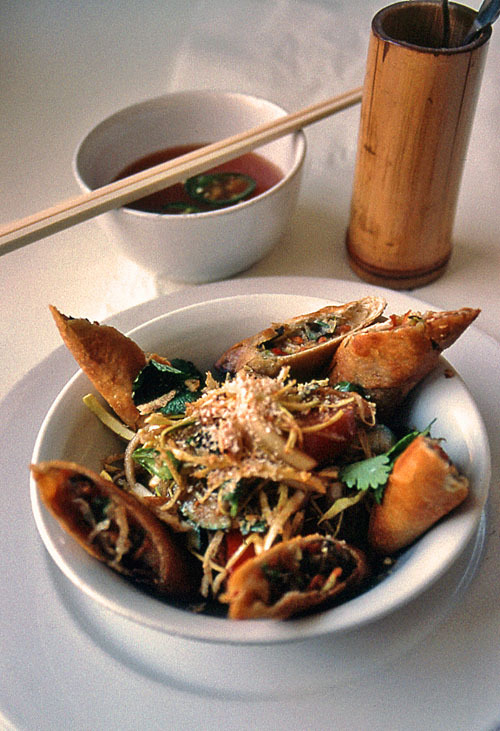 Among our favorites: Vietnam spring rolls, spicy cellophane noodles and duck salad, mee goring egg noodles with pork, chicken and shrimp…and fiery curry of tender beef-on-the bone with eggplant and peppers you want to avoid swallowing. Lush deserts, chocolate overdose, ice cream pie with chocolate sauce are smartly not south east Asian. La Cabrera and La Cabrera Norte, Cabrera 5099 and Cabrera 5127, (Palermo Viejo) T: (54 11) 4832-l5743. You might want to eat at this classic Argentine parilla (grill) just because it’s on everyone’s list. It’s a Disneyland of meat, a national wonder. Start with ham or grilled sweetbreads, or sausage. Beware the weird foccacio oozing lard and the waiter determined to sell you the most expensive bottle of wine he left on your table. Nibble a little round of sausage and cheese, and watch the local food network on the big screen overhead while you wait for The Cow. It comes in many cuts: lomo (filet mignon), Chorizo di bife (sirloin), ojo de bife (prime rib eye), Asado (ribs). Marinated, not marinated, very confusing. Soon various meats, nothing as rare as we asked for, arrive on long wooden boards overbrimming the small table, with twenty or more little ramekins of sides and sauces: hummus, potato salad swimming in mayo, apple sauce, chimichurri sauce, ratatouille. And three times more than four of us can eat…or want to eat. It seems like glutton’s heaven but it’s not as though I actually liked my sausages: chorizo and morcilla criollo, a peppery blood sausage. Florencio, Francisco de Vittoria (in La Isla, Palermo) 2363, T: (54 11) 4807-6477. Cutesy and beloved little bistro in a hard to find corner between Palermo and Barrio Norte. Great sandwiches on warm house baked breads, quesadilla, pastries. 8 a.m. to 7 p.m. At dinner, Tuesday and Friday only, linen runners and handmade linen napkins replace marble tabletops. Changing menu, modest prices, cash only. Persicco Ice Cream, J. Salguero 2591 T: 4808-0888. Our favorite. Nine different chocolates. Nine dulce de leches. Really intense not too sweet sorbets. This is what lemon should be, seriously tart and deep. Two flavors swirled high in an excellent cookie-like cone are just $2.50. Freddo, in several locations is our second choice. I don’t know about you but when we’re away from home for more than a week, we start craving pizza. What expert shall we trust? 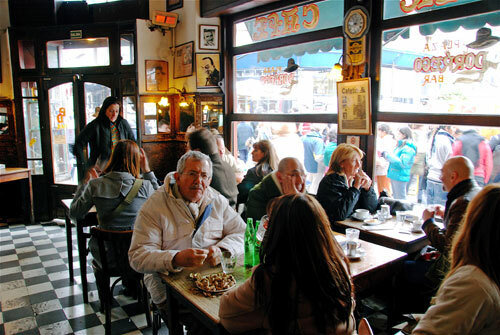 We learn that sommeliers and football players hang out at Lucky Luciano Trattoria, Cervino 3943 Palermo Zoologico T: (54 11) 4802-1262, cluttered with posters and odd artifacts in homage to New York’s Little Italy, the Mafia and Hollywood. Seems the owner was a sommelier for years and the garden is idyllic in most weather. The pizza toppings are excellent but the small pastry rounds from the clay oven are too soft and thickish for us. Morelia, Baez 260 in Palermo T: (54 11) 4772-0329, was dark and smart looking and try not to eat too many strips of sensational warm pizza bread. We sprinkle crumbled parmesan over not exactly al dente penne rigate with dribbles of hot chili pepper on the edge of the plate and a decent puttanesca sauce ($5US). Slightly free-form grilled pizzas arrive on wooden boards with a triangular spatula for serving, thin crust looking like matzoh, really charred, crisper than crisp, the Calabrese better than the too cheesy Romana. My red wine by the glass is worth $2US. Fabulous blackberry-currant tart, with two huge globes of vanilla gelato is a steal at $4US. Los Immortales, Lavalle 746 T: (54 11) 4322 5943. Surrounded by A giant PHOTO montage of a century of Immortals, we’re happy with a $3.75US anchovy and olive pizza, not too cheesy, its crust not exactly super-thin but full of flavor. The $7US mediana Calabrese is exactly the cheese-slogged artifact the natives expect, unless they order fugazza (sauceless and smothered with onions). El Cuartito, Talcahuano 937 Barrio Norte T: (54 11) 4816 1658. A local institution with standup gulpers at a counter and grab your own small table. Our guide here, an expat from Manhattan’s theater world, favors the $8 US “everything” pizza and we share quite good empanadas waiting for the pie. Good crust, granted. But the clash of everything –- peppers, Roquefort, ham, fresh tomato, onions, parmesan, mozzarella and fresh hearts of palm covered with pink sauce (they call it golf salsa here) is too Dagwood for me. Several streets close to traffic and flea market stalls crowd Dorrego Square. No need to arrive at 6 a.m., 11 or so is perfect. 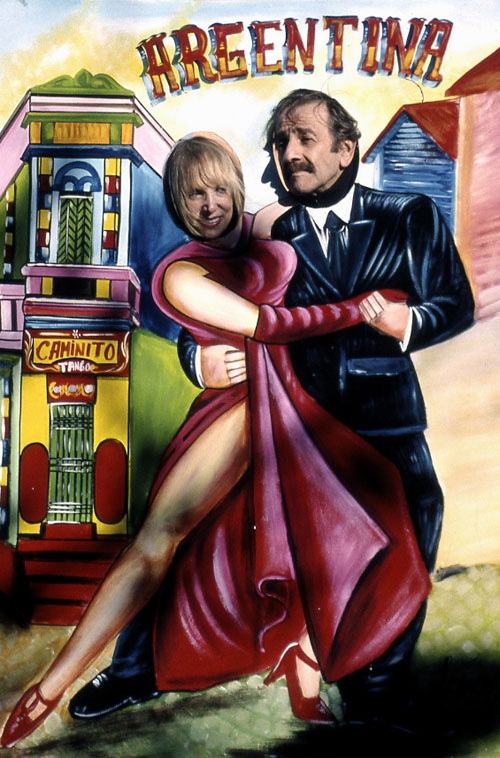 Buenos Aires is a lazy town. 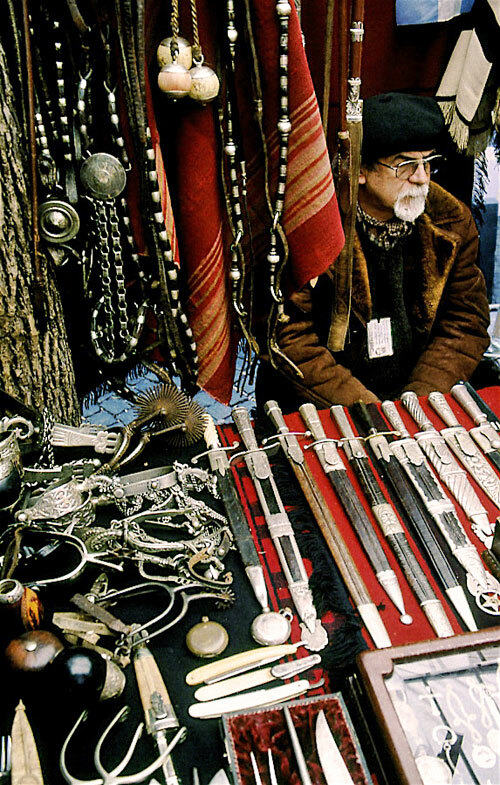 Tourists and locals mingle, eyeing crocodile bags old and new, not-very-tempting costume jewelry, vintage linens and clothing, somebody’s family silver, guns and gaucho gear, the familiar china and glass chochtkes you see in flea markets everywhere. Antique shops and a rash of co-op boutiques with local designers line the streets. Stroll down Defensa to buy souvenirs. An old woman tangoes by herself. A grinning guy plays the guitar. Mimes pose for photos and a couple demonstrates frozen moments with umbrellas and strobe lights. Down the block a man and a woman hold high signs offering free hugs. Enter a covered gallery on Defensa with antique and collectible merchants on either side leading to a food market one flight down at the end. La botika de Vicki is in the Pasaje de la Defensa. 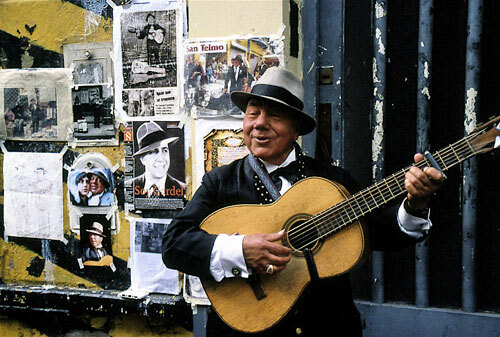 Outside the Dorrego Bar, Defensa 1098, on the corner of Defensa and Carlos Calva Streets, a tireless middle-aged guy in a fedora cajoles one giggling tourist after another to join him in the tango. Mostly young girls. I wonder who should get the tip. Inside the ancient bar, we compete for a table. Shameless aggression honed in Manhattan works. Familiars order beer and peanuts in the shell or sandwiches de miga -- “crumb sandwiches” the menu translates. Pressed and toasted white bread sandwiches, three triangles to a $3 order, layering ham and cheese so thin, the taste is elusive. On a chilling July day you might be longing for hot chocolate. What you’ll get is a glass of hot milk and a small chocolate bar to melt in it. Quite unsatisfactory. But you can sit for quite a while hoping to catch a waiter racing by.